Some of you might be thinking of installing a suspended (or "floating") ceiling with resilient channels to reduce sound transmission between upstairs and downstairs floors. If you go this route and go to the expense and trouble of demolition and remodeling -- or you're building new construction -- make sure that you affix the channels properly to the wood framing. Improper installation can create a "fail" that continues to allow noise transmission between floors. These illustrations on the UK website, Sound Service, shows a close up of how the resilient channel should be attached to wood floor joists, as does this UK website, Custom Audio Designs. Attaching them so that they flex away from the wood framing reduces vibration that typically transfers from floor to floor, and this is what's meant by the term "floating." This page from Build with Mark explains the concept, though the photo is less clear. After attaching the channel to the joists or studs, the new drywall gets affixed to the channel (not the framing!) approximately every 12 inches. 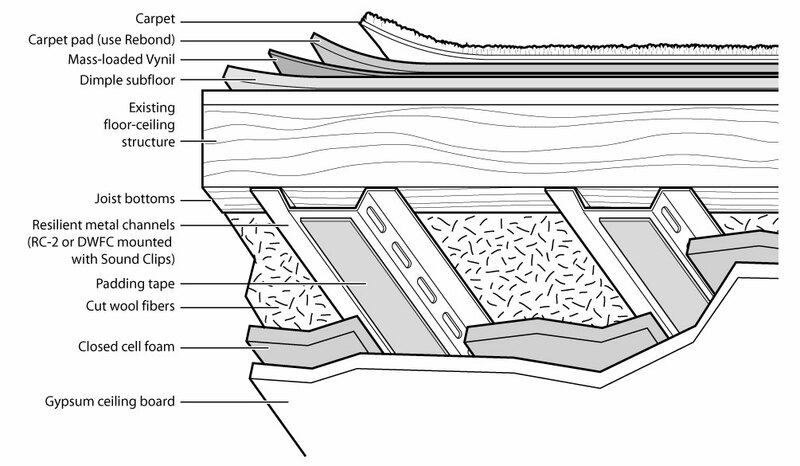 This illustration on the soundproofing.org website shows a close up of the RC channels with their own recommendations for layering the materials between floors. If you've gone this far, you should be using a professional, layered soundproofing drywall, such as one from QuietRock or Supress. Using a single layer of "normal" 5/8" gypsum wouldn't be effective. Don't forget to add sound-dampening materials into the space between the floors (or walls) after you've opened it up, and before you attach the new ceiling. Add more mass, plus some "softer" materials, like sound-absorbing batts (fiberglass or another material, like rock wool). The additional mass can come from affixing an additional layer of drywall or sound board to the backside of the upstairs floor with Green Glue and a few nails, or you can add a layer of mass-loaded vinyl along with the batts, or both. And use flexible, acoustical caulk (like StopGap from Auralex or QuietSeal from Quiet Solutons) between the edges of your ceiling and walls when you're finished. You're trying to to reduce both airborne and impact noise between floors, so now is your opportunity to add materials to solve both problems!